You might be thinking of spending money on home improvements. Perhaps Double Glazing is on your list of priorities. Perhaps you are looking to improve your energy efficiency that bit more. What can energy efficient glazing do for you? This article will aim to give you an overview on the type of energy efficient glazing available in the market today. Let’s start with some basic science. All properties lose heat through windows. By making a hole in the fabric of the wall, which by essence is fairly solid and robust, and putting in a window which is made of less robust material and much thinner, then the heat loss prevention properties of the wall are undermined. The bigger the window area in a room or in the whole property then the greater the potential heat loss throughout. The more heat loss then the more the heating system has to work to maintain an ambient temperature in the property. This means you will burn more fuel and your utilities bills will be higher to compensate. 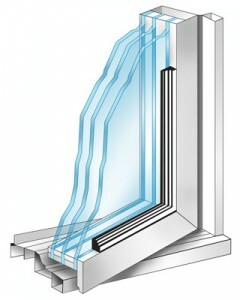 Of course there are measures you can take to help make your existing windows more efficient and mitigate the heat loss. These have been covered in detail in several other articles, but include measures such as fitting and lining curtains and draught proofing. However, if you do want to go ahead with new or replacement glazing then you should take to select the right glazing. If you are in a listed building or a conservation area then you must speak to the Local Authority to assess your options or what would be permitted. You might have very limited choices, if any. For most people there are the choices between standard double glazing and triple glazing, which is relatively new into the UK Market. Both come in a wide variety of frame styles and materials. They also vary in energy efficiency as they act to stop the process of heat passing from the window and how much sunlight can come through the glass. Double glazed windows use two sheets of glass with a gap between them. This gap creates an insulating barrier. In many manufacturers windows these gaps could be filled with a gas such as argon which help to make the window more resistant to heat transfer. Triple glazing uses the same process but instead of two sheets of glass there are three sheets, with two insulating gaps between the panes. The gap between panes is kept apart with spacers. In the more energy efficient windows these spaces are made of a material that contains no metal, and is therefore less conductive to temperature. The glazing itself can also be treated to provide additional energy efficient benefits. The glazing can be what is known as low emissivity or Low E. This is where a coating of metal oxide is put on the inside of an internal place next to the gap. This coating lets sunlight and heat in, but reduces the amount of heat that can escape. There are also a myriad of types of frame, including wood, uPVC and aluminium, but although they each have minor effects on the efficiency of the window, overall the glazing is the most important element as long as the frame is properly fitted and structurally sound. The frame is more a matter of budget and cosmetic choice. When selecting glazing you can normally check the energy efficiency rating of the product by looking to see if it has an Energy Saving Trust Recommended Logo, or by looking at the BFRC energy label, which should rate the windows efficiency on scale similar to that of an Energy Performance Certificate or an Appliance Rating. The higher the rating then the more energy efficient that the glazing. You should not expect massive savings with Double Glazing or Triple Glazing. Any purchase is definitely a long term one with a long term return on investment in mind. It is estimated that an average property can save potentially £130 per year by going to Double Glazing. The presence of energy efficient glazing will definitely help to reduce bills, carbon foot print and help to retain the ambient temperature for longer. The other factors are such as noise and condensation reduction as well as improvements to ventilation. Replacement glazing is a valuable addition to energy saving measures, but there are lower cost measures which can be installed which have a much better effect on your energy usage, such as cavity wall insulation or the right level of loft insulation. However, if you have already done these measures, or are just in the position that you want to or need to replace your windows, then you should consider the most energy efficient ones that you can afford. It may be a little, but it will still save you money! Dont be led into a false sense of security with A rated windows a far more efficient measure of window performance is the U-value. Building Regulations for New Build require A Rated as a general rule which has a U-value of 1.4 Wm2K.